Cyber Security Management: A Governance, Risk and Compliance Framework by Peter Trim and Yang-Im Lee has been written for a wide audience. Derived from research, it places security management in a holistic context and outlines how the strategic marketing approach can be used to underpin cyber security in partnership arrangements. The book is unique because it integrates material that is of a highly specialized nature but which can be interpreted by those with a non-specialist background in the area. Indeed, those with a limited knowledge of cyber security will be able to develop a comprehensive understanding of the subject and will be guided into devising and implementing relevant policy, systems and procedures that make the organization better able to withstand the increasingly sophisticated forms of cyber attack. 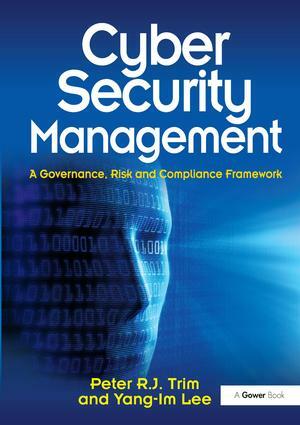 The book includes a sequence-of-events model; an organizational governance framework; a business continuity management planning framework; a multi-cultural communication model; a cyber security management model and strategic management framework; an integrated governance mechanism; an integrated resilience management model; an integrated management model and system; a communication risk management strategy; and recommendations for counteracting a range of cyber threats. Cyber Security Management: A Governance, Risk and Compliance Framework simplifies complex material and provides a multi-disciplinary perspective and an explanation and interpretation of how managers can manage cyber threats in a pro-active manner and work towards counteracting cyber threats both now and in the future. Peter Trim is a Senior Lecturer in Management and Director of the Centre for Advanced Management and Interdisciplinary Studies at Birkbeck, University of London. He is co-author of Cyber Security Culture: Counteracting Cyber Threats through Organizational Learning and Training and has published widely in the areas of strategic marketing and corporate intelligence. He has been involved in two network security projects funded by the Technology Strategy Board, one of which was also funded by SEEDA. Yang-Im Lee is a Senior Lecturer in Marketing at Westminster Business School, University of Westminster. She has studied at several institutions including SOAS and Stirling University. She has published widely in the areas of culture, strategic marketing, and international management and has worked on two network security projects funded by the Technology Strategy Board, one of which was also funded by SEEDA.